Conversely, users who are retweeted by others are less likely to be ‘unfollowed’, as are Twitter relationships that have overlapping ties. 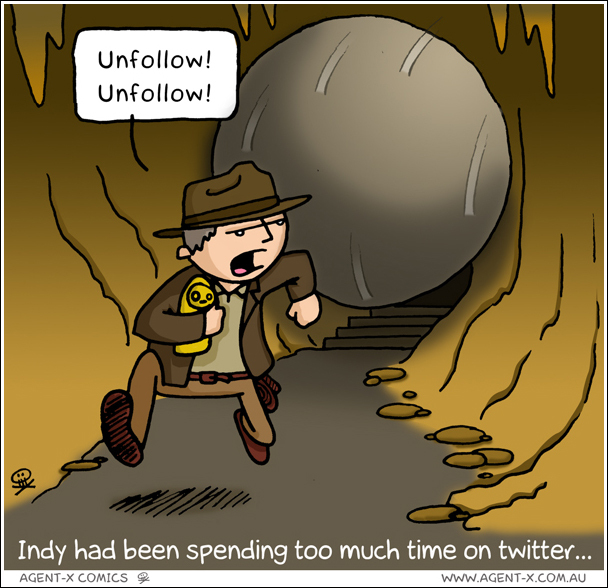 Most interestingly, lack of direct interaction is not correlated with unfollowing behaviour. Moon found that 85.6 percent of the Twitter relationships she studied do not involve any interpersonal exchanges (including replies, @mentions or retweets) and 96.3 percent of Twitter relationships survive on fewer than three exchanges. Moon noted that traditional media and marketing campaigns do not understand these nuances of social media relationships and online etiquette. As such Moon argues large corporations have not been very successful in capitalising on the full potential of social media platforms. Most studies on Twitter trace the patterns of information and social exchange between active relationships. Moon notes that her study is unique because it offers sociological data on the break-up of online social networks (rather than on existing links). At the same time, although Twitter relationships operate through somewhat familiar conventions, some of its interpersonal communication features are unique. Moon mentions that unlike other face-to-face relationships, choosing to unfollow someone on Twitter does not require the notification or approval of the other party. Moon’s findings on unfollowing may be culturally specific to Korean users. Then again, other sociological research published in Science and recounted in the New York Times suggests an intriguing premise that the moods of Twitter users follow similar trends across cultures. Scott Golder and Michael Macy studied the tweets of two million users across 84 countries. Their study was not measuring unfollowing trends, but their data show that there are emotional similarities in the daily and seasonal use of Twitter. (The researchers find that people tweet unhappy messages in the mornings, even on weekends.) Perhaps Golder and Macy are onto something. Other reports on influential Twitter users show that unfollowing people unleashes a massive emotional backlash from users. There exists a tacit Twitter norm which compels some people to automatically follow back everyone who follows them. When someone has thousands of Twitter followers, however, this practice makes Twitter feeds hard to manage and it attracts spammers. This has led to a couple of infamous cases of Mass Unfollows. Mashable reported in 2009 that when Robert Scoble unfollowed 106,000 people, more than 7,000 accounts immediately unfollowed him back. Scoble assumed that they were either spambots or lameos who were only following him to get a higher follow count in the first place. Not cool dudes. Scoble noted his spam automatically ended when he unfollowed everyone, so there was instantaneous benefit for him in taking such drastic action. wanted to keep ‘the channel [of communication] open’ even after he unfollowed them. wanted reciprocity: people publicly tweeted that they were unfollowing him because he unfollowed them. assume the rules of Twitter are set: Brogan disagrees with this notion. He sees that the social norms of Twitter are ‘imaginary’ and they can therefore be tested and modified to suit an individual’s ‘own way’. He suggests the rules one follows on Twitter should ‘Make it valuable for you’. For some people, Twitter unfollowing is emotionally fraught and presumed to be an act of denigration. 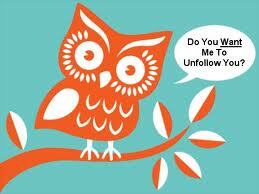 For others, unfollowing is either a necessary action to make Twitter interaction with others more meaningful. Either way, sociology research highlights how social norms that underpin other social networks offline also apply online, but other social norms that are unique to Twitter are still being negotiated by users. I haven’t seen people discuss “unfollow amnesty” very much: the concept that if you unfollow me, I won’t hold it against you or gossip about the event. I find this concept very useful and it makes my Twitter experience feel safer and gentler. Hi Sashafeather, thanks for your comment. I like this concept very much! I’ve not heard of it before but I’ve done a search and I see it used a lot on Tumblr (not by anyone I follow, interestingly) and I see individuals tweeting this phrase. I’ve looked for research and there appears to be none on this specific concept. It’s interesting that you talk about the “unfollow amnesty” providing you with a sense of safety. I see that social media requires a lot of “emotion work”: we sometimes have to work hard to understand the rules that others are using in their communication and we also have to look after our own emotional wellbeing when tweeting. The emotional responses that Chris Brogan noted when he mass unfollowed people are interesting but ultimately describe dysfunctional relationships on Twitter. These people may be overtly focused on growing their follower count rather than on producing and reading quality content. I see no need to unfollow people if they unfollow me – if they’re writing things that I want to read, I keep following them. I rarely unfollow individuals because I’m focused on specific content (sociology, women’s rights, anti-racism, social justice and public science education). I generally don’t follow people who tweet outside topics I’m passionate about or people who tweet personal things. This keeps my timeline focused on relevant tweets and great commentary. I do unfollow (and block) people who harass me, and there’s only been a couple of cases where I’ve unfollowed people because they changed the themes of their tweets over the long term (e.g. they started to tweet on sports scores exclusively rather than social science). I try to stay away from people who are clearly following and unfollowing people en mass to grow their follower count (usually SEO marketers!). 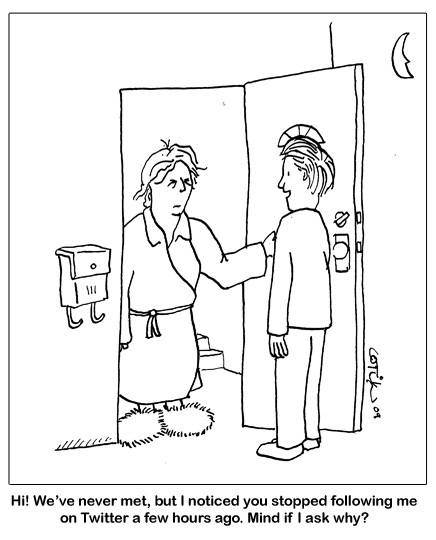 I have had one person scold me (in person) because that person followed me and I did not reciprocate. I do not in fact check on who is following, or who unfollows me, on the grounds that it is entirely their choice to curate a Twitter feed that works for them (that amuses or informs them, for instance, or whatever it is they’re looking for in their feed.) I do not expect to be followed as a result of my following another account…and am not upset when someone unfollows me (and, again, do not keep track of who does which. Periodically I mention that I don’t follow everyone who follows me, for reasons of time, and less often admit to pruning the follow list. I try to keep my feed at a level where I can scan nearly all tweets sometime in the 24 hours when they appear, so I can take advantage of the information in them, especially interesting-looking links. I retweet when I think something is interesting or important (not necessarily when I agree with it.) I follow some accounts precisely because they retweet other tweets that contain links of interest, and may or may not (depending on the relative density of interesting information) then follow those accounts. When I unfollow someone, it is not a commentary on that person, but on the relative interest in the content of their tweets (links included.) I have unfollowed someone who turned out to be an avid fan of a sport that doesn’t interest me, tweeting hundreds of details of a competition (and realizing this would happen again and again.) I may follow an account temporarily (intentionally so) in emergency situations (e.g. in Hurricane Sandy I added multiple accounts for the duration.) If I’m already reading someone’s blog regularly, I’m less likely to follow their Twitter account. Twitter gives me access, through selection of accounts, to a variety of academic fields–an inside view not only of the work going on now, but of the lives of individuals and the issues that affect them. I find it educational, stimulating, sometimes fun (the FieldWorkFAIL hashtag for field biologists) and provides me with an easy way to run across many viewpoints from around the world. If I were stuck in bed with nothing else to do, I’d follow more (there are WAY more fascinating people doing interesting things than I have time to read in a day!! Let alone engage with.) Then there are accounts I follow for business reasons. So I suspect I use Twitter in a somewhat different way, and I certainly don’t have the social expectations regarding following and unfollowing that many appear to. Each person has their own reasons for how they order their account; mine make sense to me. Hi EMoon. Thanks for sharing your thoughts on following and unfollowing on Twitter. For casual users, Twitter patterns and attitudes fluctuate, but for regular users, especially scientists who tweet original content, following and unfollowing can take on other dimensions, because it’s more about building relationships and nurturing a network. I don’t follow back everyone but I am always looking to make interesting new connections. I unfollow when I see people being abusive or passive aggressive (I especially unfollow sub-tweeters!) or being contrary to social justice issues that matter to me (when I see people supporting or being complicit in racism or sexism for example).